After peaking in the late '90s, use of U.S. mills that churn raw cotton fiber into spun yarn has been stable since 2008. Shoppers are inspecting goods for "Made in USA" labels, as a deep recession has encouraged more Americans to reflect on lost manufacturing jobs. But what about the fabric used to make apparel and home furnishings? That material comes from where? Most textile manufacturing is based in Asia. But cotton—the soft, fluffy staple that for decades drove the American South as a one-crop economy—has been enjoying a modern renaissance of sorts. 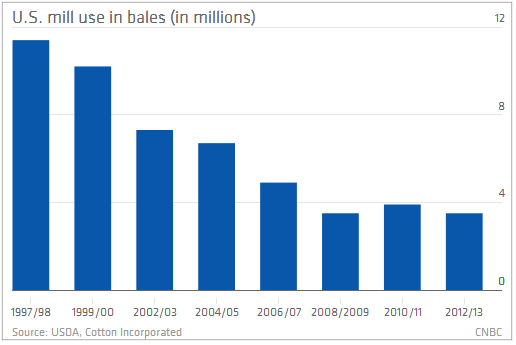 After peaking in the late '90s, use of U.S. mills that churn raw cotton fiber into spun yarn has been stable since 2008, according to Cotton Incorporated, a trade group that works to support cotton's share of the textile markets. The U.S. is the world's third-largest cotton-producing nation behind China and India, among more than 70 countries. Now Cotton Incorporated and Maker's Row—an online marketplace—have partnered to bring back more "Made in USA" goods. Maker's Row is a community of entrepreneurs, designers and businesses that are collaborating to boost American manufacturing. While makers of apparel and other goods may want to produce "Made in USA" items, easy access to the domestic supply chain remains a key hurdle. Maker's Row, based in Brooklyn, N.Y., also has launched a Web page that features more than 20 U.S. cotton mills and suppliers of cotton-based materials. Participating businesses comply with Cotton Incorporated's quality and responsibly produced cotton requirements. The platform is designed to help businesses, many of them small- to mid-size, access cotton-based suppliers and manufacturers in the U.S.
"This partnership provides brands with a deeper understanding of one of the principal materials used in apparel today," said Matthew Burnett, chief executive of Maker's Row. Jason Felton and Felton Farms cultivate about 8,000 acres of cotton in Marianna, Ark. To be clear, increased mill use or even new mills don't necessarily mean large numbers of American manufacturing jobs, as was seen about 30 years ago. Modern mills incorporate automation. Instead, the partnership is intended to make sourcing of American textiles easier. "The benefit from our perspective is reminding these new, U.S.-based textile facilities that there is an ample supply of responsibly grown cotton in their own backyard," said David Earley, senior director of global supply chain marketing for Cotton Incorporated. One cotton business participating in the partnership is Felton Farms, which cultivates about 8,000 acres in Marianna, Ark. Armed with technology including GPS, Felton and other cotton farmers are able to pinpoint and track cotton field soil and water amounts in real time. The idea is to highlight a sustainable product on sustainable land, said Trent Felton, founder of Felton Farms. The end result, of course, is more "Made in USA" goods, manufactured with American textiles. Added Felton, "I encourage people to look at the tag and look at the material in the clothing."